Microsoft just released the Extensible Network Monitoring Management Pack Generator tool which allows you to build custom SNMP management packs. In my previous post SCOM 2016 TP5 I have written a post about the prototype of this tool which was command line driven. I addressed some missing parts like a GUI, custom SNMP components and handling more complex SNMP values. Guess what?! 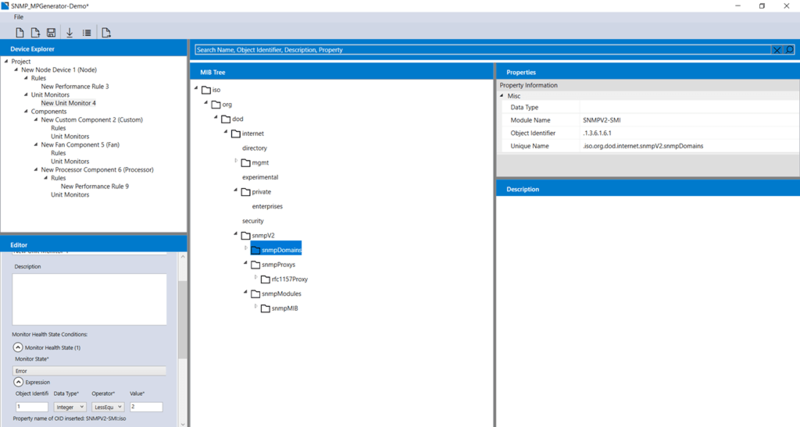 Microsoft listened and released a GUI based (and also a command line based) tool to create your own SNMP management packs..
SNMP_MPGenerator tool has an inbuilt MIB browser. Users can load MIB files, search through the Object Identifiers (OIDs) of the component they wish to add workflows for and create rules and monitors. Users can add monitors and rules for device components such as Processor, Memory, Fan, Temperature Sensor, Power Supply, Voltage Sensor and Custom device components. This tool would also support custom devices in addition to already supported devices like Switch, Router, Firewall and Load Balancer. The tool is free and comes with a detailed documentation how to build an MP. I just have clicked through the tool and it seems to be very self-explaining. The GUI has basically two parts, the MIB browser which let’s you import MIBs and browse/search through the MIB tree and the editor part were you can add components, rules and monitors. The MIB browser is just for finding the proper OID for each component and then you are able to copy/paste the value to the proper place in the editor. For the command line tool you need to configure a XML file as input. I think it is a very nice approach and let’s see how it will perform in some upcoming projects download the tool here.